1863: Whitridge & Company Paper Manufacturers, Morda Paper Mill. Photo of the Drill pub now called The Miners Arms. This would have been a very busy pub, with the miners finishing their shift and then relaxing at the end of the day. 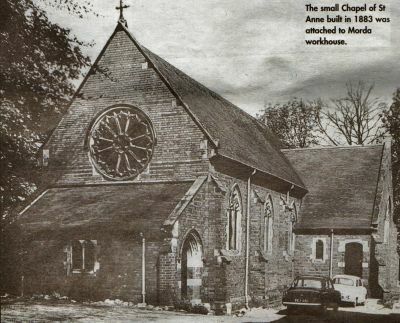 This photo is of the former Hen & Chickens pub. It was where the miners collected their wages. Quite often their wives would wait outside to stop them spending all their earnings inside. The building is now a private house. 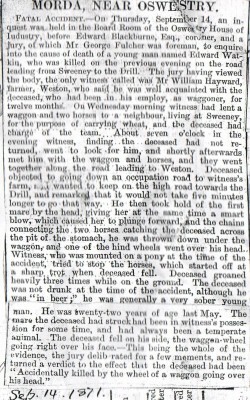 Newspaper cutting of a fatal accident in Morda dated September 14th 1871, involving a young man killed by a horse.